Central Harlem has been a cultural and artistic mecca since the 1920's and the birth of the Harlem Renaissance where it gained notoriety for its diverse population and rich heritage. 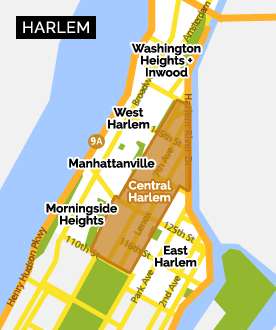 The neighborhood extends from the north end of Central Park at 110th Street to the Harlem River, and from 5th to St. Nicholas Avenues. The 50th annual African American Day Parade, Inc.
Alibi Lounge · 2376 Adam Clayton Powell Jr. Blvd. Belle Harlem · 2363 Adam Clayton Powell Blvd. Bier International · 2099 Frederick Douglass Blvd. Charles' Country Pan Fried Chicken · 2839 - 2841 Frederick Douglass Blvd. Doug E's Chicken & Waffles · 2245 Adam Clayton Powell Blvd. Harlem Bar B Q · 2367 Frederick Douglass Blvd. Harlem Burger Co. · 2190 Frederick Douglass Blvd. Hyacinth's Haven Bar & Restaurant · 2374 Adam Clayton Powell Blvd. IHOP - International House of Pancakes · 2294 Adam Clayton Powell Jr. Blvd. Jado Sushi · 2118 Frederick Douglass Blvd. La Marmite · 2269 Adam Clayton Powell Blvd. Lavain Bakery · 2167 Frederick Douglass Blvd. Les Ambassades · 2200 Frederick Douglass Blvd. Lido · 2168 Frederick Douglass Blvd. RDV Rendezvous Harlem - Harlem's Modern French Bistro · 2072 Frederick Douglass Blvd. Savann Restaurant - Mediterranean Cuisine · 2280 Frederick Douglass Blvd. Streetbird Rotisserie · 2149 Frederick Douglass Blvd. Digital Harlem Blog · "Digital Harlem: Everyday Life, 1915-1930"
Bethel Gospel Assembly · 2-26 East 120th St.
First Ebenezer Baptist Church · 2457 Frederick Douglass Blvd. Greater Zion Hill Baptist Church · 2365 Frederick Douglass Blvd. LaGree Baptist Church · 362 W. 125th St.
Mount Neboh Baptist Church · 1883 Adam Clayton Powell Jr. Blvd. New Covenant Life Christian Center · 2433 Frederick Douglass Blvd. Shiloh Baptist Church · 2226 Adam Clayton Powell Jr. Blvd. VISIONARY BOOKSTORE · 2262 Adam Clayton Powell Jr. Blvd. Williams Institution C.M.E. Church · 2225 Adam Clayton Powell Jr. Blvd. Best Yet Market - Harlem · 2187 Frederick Douglass Blvd. Cantina 1838 · 1838 Adam Clayton Powell Blvd. Capital One Bank · 2310 Frederick Douglass Blvd. Common Good Harlem · 2801 Frederick Douglass Blvd. Donna Dove Fashion Designer, Artist and Entrepreneur - Harlem · Adam Clayton Powell Blvd. Franz James Floral Boutique · 2114 Frederick Douglass Blvd. Frederick Douglass Circle · 110th Street & Frederick Douglass Blvd. Gallery 8 · 2602 Frederick Douglass Blvd. Harlem Chocolate Factory · 2363 Adam Clayton Powell Jr. Blvd. Harlem Food Bar (HFB) · 2100 Frederick Douglass Blvd. Harlem Hospital - Herbert Cave Auditorium · 506 Malcolm X Blvd. Harlem Seeds Cultivating the Seeds of tomorrow, one child at a time. Harlem Vintage · 2235 Frederick Douglass Blvd. ImageNation RAW Space · 2031 Adam Clayton Powell Blvd. Iris House · 2348 Adam Clayton Powell Jr. Blvd. Just Lorraine's Place · 2247 Adam Clayton Powell Blvd. La Casida Garden · 223 East 119th St.
Long Gallery Harlem · 2073 Adam Clayton Powell, Jr. Blvd. Malcolm Shabazz Plaza · W. 110th Street at the confluence of Malcolm X Blvd. Manhattanville Social · 2647 Frederick Douglass Blvd. Maysles Cinema Theatre Rental · 343 Lenox Avenue/Malcolm X Blvd. National Black Leadership Commision on AIDS · 2285 Adam Clayton Powell Blvd. Renaissance Fine Art (RFA) · 2075 Adam Clayton Powell Jr. Blvd. Rucker Park · 155th Street and Frederick Douglass Blvd. Saint John's Pentecostal Church · 440 Malcolm X Blvd. Sol Studio · 2073 Adam Clayton Powell, Jr. Tea & Things of That Kind · 2340 Adam Clayton Powell Jr. Blvd. The World is Watching - HARLEM! NIKE Gallery · Frederick Douglass Blvd. Weston United Visionary Bookstore · 2262 Adam Clayton Powell, Jr. Blvd. X Gallery · 163 Malcolm Blvd.